They fit onto a from made from Lego as in the image below. At present, these bricks are only available from us via our eBay shop. Please note that due to the size of these, they are almost always cut to order. Made from bonded polycotton for added strength; one side is red and the reverse is black. Due to the size of these capes and the amount of material required I am afraid I am unable to give massive discounts on bulk orders like my other capes. 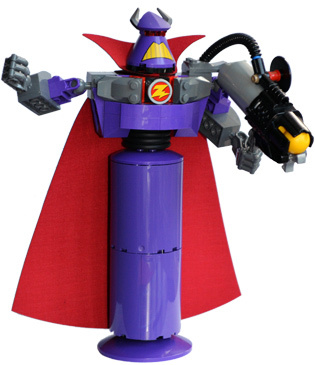 For postage reasons, these capes will be folded; ie were you need to fold them to place on the large zurg. If you wish to be different, it is possible to make them in other colours; get in contact to discuss if this is something that interests you. Avaliable in Red like the film or Black if you prefer. They fit onto the Lego Set made in 2009. Please note that due to the size of these we are unable to offer massive bulk discounts. Also note that they are almost always cut to order.